Preheat the oven to 350 °F, and fill a cupcake pan with liners. In a medium sized bowl, combine the baking soda and hot water. In another bowl, beat together the butter, molasses, and brown sugar with an electric mixer. Add the eggs, one by one, and mix thoroughly after each addition. Add the baking soda mixture to the butter mixture, then add the the flour, baking powder and spices. Mix until everything is well combined. Fill each cupcake wrapper ⅔ of the way, and bake the cupcakes for 25-35 minutes. 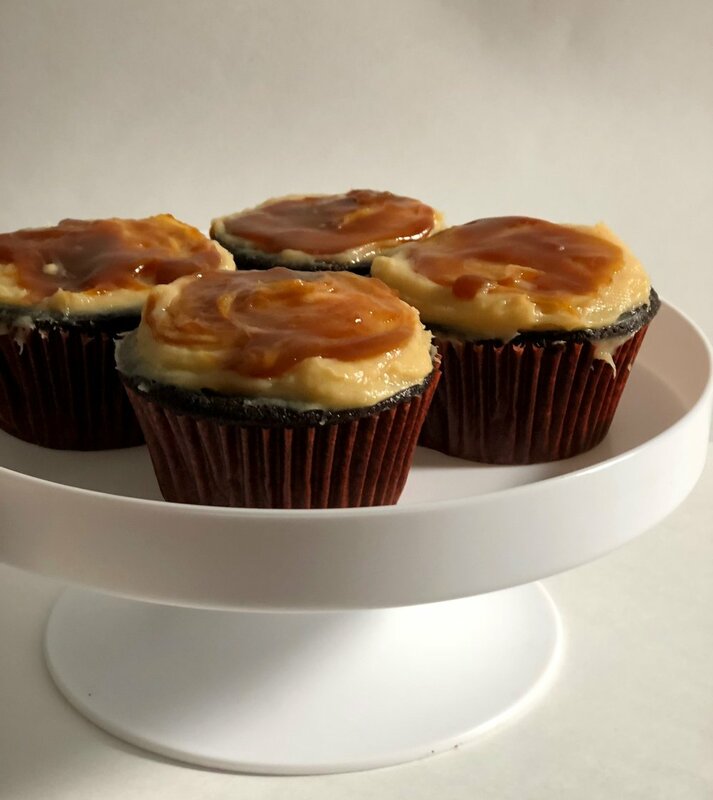 While the cupcakes are baking, start on the caramel. Place a pan over high heat and add the sugar, cook until all the sugar dissolves. If the sugar on the edges of the pan begin to burn, run a wet brush or wet wooden spoon along the sides of the pan to help dissolve the sugar. Once all the sugar has dissolved, remove the pan from the stove and add the butter and the milk, and mix quickly. The mixture will bubble and the caramel will appear to form hard chunks. This is totally normal. Return the pan to the stove and stir over medium heat. The mixture will turn into a smooth caramel. Continue stirring the caramel until it thickens to about the consistency of molasses. Once the caramel is cool, mix together the butter, cream cheese, vanilla and half a cup of the caramel. Add the confectioner sugar and mix until the frosting is smooth. To assemble the cupcakes, frost a cooled cupcake with the caramel cream cheese buttercream. Then use the remaining caramel to drizzle over the cupcakes or swirl into the frosting.